Dear gentle readers, my father, Hj Anwar Batcha Hj Ibram Ghaney, (a.k.a fathersez) had passed away due to heart failure on the 4rth of August 2009 in Sunway Medical Centre. It was a really shocking news to us and we are still very much coping with things without our beloved father. Our loss was indescribable. For those who knew my father, they would know that he was a good and humble man, a reliable friend, a wise teacher, a sincere and honest individual who are always willing to share his knowledge and experience to anyone including a stranger, the best boss anyone would want to work with, a responsible husband and a wonderful father anyone could possibly ask for. Truly my father was known to be a respectable man, a far-thinker, principled, god-fearing, intellectual and a wise man. I am typing this with tears flowing down my cheeks as I could not control myself how grateful my siblings and I were to have a father who has done a lot for us and he has not once (not even once) troubled those around him even he when he was sick and till the day he died. What sadden me the most is that he had left us in a such an organized way where he had the will done so much earlier when we were small (he had to keep on updating it then), he had all his documentations filed in a such organized way where it had made our lives easier to understand his filing manner after his demise. Yes, two or three weeks before my father’s passing, I had dreamt of him passing away. Little did I know that the dream was about to come true at that particular time. Sadly, I couldn’t go back to our home in Seremban as I was also infected by this so called dangerous Influenza A virus (H1N1). I was quarantined and I choose to stay in Damansara as I learnt that if people with diabetics and heart disease or older people were infected, it could be deadly. Therefore, I would rather stay somewhere else rather than to harm my family. One week before my beloved father’s passing, a family meeting was held in our home. My father had told my siblings and I on what we should do if something were to happened to him and our mother. He had also brought a lawyer to our home just for us to understand all the will and probate concept. The lawyer was a good and nice man, but we have no questions to ask as it was a very sad topic and our beloved dad was okay at that time. We did not feel as if it was necessary to understand the concept at that particular time. Therefore, the lawyer’s laugh and said that we can ask him anything, anytime should we have any queries. Shocking as I must say, just before the lawyer was about to leave, my late father said to him, “So, if you received a call from my daughter, you know what it means”. The lawyer was shocked and told him not to say such thing. It was as if he knew that he was going to leave us. This was few three days before his passing. I am very sure of the timing as three days after we met the lawyer; I had to sit for my Islamic Finance’s professional paper exam. It is sad that I did not get the chance to see my father when he was still alive on his deathbed. A wise friend told me that all the traffic jams and delays that made me came to the hospital late was the Almighty Allah’s will; maybe Allah wants me, my other siblings and mother (except for the eldest, she was there with our father) to have the memory of our late father Alive. This holy month, Ramadhan will be the first ever Ramadhan without my father. What I learnt from my late father is that it is always important to save for the rainy days, be punctual, always choose god-fearing friends and we should always respect people in order to be respected. My father had never ever skipped his prayers, no matter how busy he was. He will turn to various hadiths and the Quran if he had any doubts. He would do sunnah prayers if he felt sad and in order to seek guidance. And if he was feeling so much grateful for something or sad beyond words, he would book a ticket to Mecca and perform his Umrah. He will always spend his time reading and doing productive activities. My late father was a hard working and sincere man. Being an accountant by profession, he had always been frugal, and saving was his main priority. My late father was a super dad to us and understanding father as he listens to our wish and wants. However, he will ask us to weight it with our priorities. He has never beaten us (not even once), like all the parents do when they want to so-called teach their children on manners and principles. My father was wise enough to treat us like an adult since we were young. He was and will always (still) be my mentor and idol despite his demise, as I am very sure I will never ever meet anyone close to my late father’s personalities. I still remember when I was working in one of the big 4 firm, my father had told me to find a mentor and start learning from that particular person, I told him straight away that my mentor was him and that there was no one in the firm that was fit and had strong personalities like him. Still, even if you ask me 30 years from now, my mentor would still be him. Not that I adore him because he was my father, I adore my father as an individual. Dear readers, do pray for my late father and recite Al-fatihah for him as he was a good man and a wonderful person you would wish you could have met. Having a person like my father makes the world a better place to live in. Semoga Allah S.W.T menempatkan ayah kami di kalangan orang-orang yang beriman dan bertaqwa. May Allah S.W.T grant him HIS heavens. Ameen. May my siblings and I grow to be righteous children who will always pray for our late father. InsyaAllah. We would like to thank those who had attended our late father’s funeral and continuous support and encouraging words from all of you. We have received various letters, text messages, calls, and even cards from unknown people who were thankful to have met a person like our beloved father. It is really touching when you go to a small shop or a restaurant to buy stuff or food, and the waiter or shop owner cried because you told them that your father had passed away. I had not once heard anyone talk bad or heard any bad comments on my father. My father had always had the “positive aura” around him. He was truly, almost perfect. We love him but Allah S.W.T loves him more. And we could only think of nothing else except so highly of our late beloved father…..
p/s: this was sumthing i wrote back during the holy month of ramadhan. Just my thought of sharing. My mother, Hjh Zuraidah Hj Abdul Aziz,had just passed away last Friday (05/03/2010) at 3.10 pm in KPJ Seremban.All of my siblings and I was there with her when she breathe her last. My mother was buried in Senawang and the funeral was done on the same day. My mother left us with a smile on her face…and plus it was friday…I wasnt sad because I want her to come back. but I am just sad that she had to go through so much mental turmoils and pain…but I had always told her and reminded her that Allah SWT would forgive all her sins when she is sick and in so much pain.Ya Allah, May you grant my mother your Jannah , Ya Allah..
As I am writing this, I am somehow happy that I did not cry much as I did before when my late father left me and my siblings…I am more calm and accepting things,in malay we called it redha than I was before..Though at times, tears will still flow.. I can just feel better by looking at her pictures as I have whole loads of my family album in my room as well as my mother’s last blouse that she wore on the way to the hospital..and also by bending down, sujud to Allah S.W.T as well as listening to the Quran. Prayers and unity really helps in times like this. My mother was beautiful, inside and out. She was very independent and she does not care if she had friends or no friends. She does not rely on people at all. She does have a few good, trusted and god fearing friends. But thats it. My mother was a Secretary by profesion, and she had met my father in one of the leading banks in Malaysia where she and my father had worked together before. My mother was jovial, happy and she had good sense of humour. My mother had stopped working completely to look after the family because when I was still a toodler, i fell down the stairs- thanks to the maid who went out with her bf and left me with my sister alone in the house. I was in such traumatic condition to my parents, but alhamdulillah I survived and now I grew up to be a fine young lady. I just wish my mother did not stop working because I feel she could had become a lawyer or anything greater than that due to her voice-up nature. My mother was very understanding and you can tell her anything. My mother had fair complexion because she had chinese-baba and nyoya blood, and she had rosy cheeks.She was very generous and she would treat you like her own family. My mother had told me not to save in terms of food and we should always welcome our guests and make sure that they eat before they leave our home. My mother was very up-to-date in terms of fashion as she used to sell nice muslimah clothings, custom jewelleries as well as crystal brooches.She would always make sure that her husband and children look neat and clean due to my father corporate reputation and as a muslim anyway. She is very hygenic and clean (clean here means, CLEAN like a real clean maniac), she would go berserk if you are in the category of hiding all your stuff in the closet, making your room looks clean, because she knows! She would even know if you sweep the floor but push all the dust under the carpet.hehe. She was also very particular about grooming, like getting your nails & hair done, doing facials as well as SPAs treatments. My mother was not born rich, so she had to do all the housework on her own, because she was the only rose among the thorns in her family. But after she got married with my father, my father provides her with so much necessities and that she does not need to do the housework or any work anymore. She just have to sit and watch my younger siblings. But like any other housewives, she would still do the housework. My mother had always told me to do istiharah in anything I plan to do. To tell you the truth, I had never really done istiharah before. I am more towards tahajud. She had told me that she was in love with someone from saudi but when she became friends with my father, she starts telling him about all her relationship problems. And my father told her , “leave him and marry me”. My mother did not like my father at first as he was an Indian Muslim and is not the type that my mother was looking for. But my mother adore his strong personalities and sincerity. She did istiharah and she felt that Allah SWT gave her the sign to marry my father. She married my father not because of love but because of religion. And so in Islam, if you pick religion, the rest will flow after that-such as wealth and happiness. My mother had been fasting always, 3 months straight starting from Rejab, Syaabaan and Ramadhan. She will sit on her sajadah early morning when my siblings and I were still snoring :),after subuh, she starts making breakfast for all my siblings and I and after all of us including my father left the house, she will continue doing prayers, until noon. How do i know this? Its because during school I had the reputation of skipping class for no reasons. I had miss classes 98 days per year approximately due to the reason I am in love with home and the Internet.I should had been home-schooled. Tsk Tsk.Seriously.My mother does sunnah prayers and reciting Quran everyday when she was still in healthy condition. My mother was diagnosed with a tumor in one of her ovaries, therefore the doctor had to remove one of her ovaries and that had made her unable to have children anymore and that, this had stopped her having menses. That is why she can fast for 3 months straight, Alhamdulillah.Only Allah SWT knows best, this misfortune turn out to be a great blessing to my mother as she can pray and fast more. Even for my late father’s employees, they could actually talk to my mother as my mother was a good and kind listener and she was alert to my father’s office environment, and she would keep their secrets well and try to help them. My mother took care all of us for years, alone as my father was working abroad. It was not easy for her as I recalled, when she was about to deliver my youngest sister, she had to take taxi to the hospital, and without her husband being with her on her side in the labour room. But Alhamdulillah, my youngest sister grew up well and healthy. Even when my father was back in Malaysia, he would still leave for overseas from time to time. I have endless stories about my parents. I have no bad stories to share with you about my parents as they are truly beautiful inside out.I am really missing both of my parents, and truly I know that they belong together in this world and in the hereafter. Dear All do pray for my mother. My siblings and I are very grateful that we were born to such wonderful, God fearing and kind parents.We hope that we could be like them too, Insyaallah. Lets recite Al-fatihah and prayers for my late father and mother.May Allah SWT forgive them and grant them Jannah.Amin Amin Ya Rabbal Alamin. p/s: I am truly sorry for taking so long to update my late father’s blog. This is actually two separate notes. Please know that it is none of my intention for the delay in updating all of you. I can be contacted at xynix1805@yahoo.com ,if you have any enquiries. Perhaps the title of the article did not do the teacher concerned sufficient justice, as the lessons seem applicable to lots of others, besides business people. I always feel gratified whenever I read articles about successful teachers. There was a time when teachers of young children held a very high post in the local community. This was befitting of the role these teachers played in shaping the minds and bodies of our young. These days the moneyed positions have taken over. Our position on the totem pole is dictated more by the earning statistics. The noble teaching profession has even been relegated to a job that one does because of a lack of any other. The ancient Hindu scriptures say, “Mother, Father, Teacher, God.” I am sure lots of thought went into the formulating and articulating of this statement, so it should not be taken lightly. I owe a lot to my teachers. They encouraged us, tolerated the usual pranks that school kids all over the world do, guided us and taught us. For this, I shall always carry a debt of gratitude, and try to pay it forward by teaching others what I can about the mistakes I have made in life. Sadly these days the teaching profession seems to have gone quite off tangent. Many teachers quit in frustration. You may read this post to appreciate this a little better. I hope one day, not too long from now, teaching will regain its rightful place in society. Society needs to place the right value on the role teachers play in shaping the most basic and fundamental building blocks of our world. And give the profession the total support, resources and recognition it needs to get the job done right. In one of my previous posts, I have written about my investment in a smallish telecommunication contracting company. The company had and still has a good track record and is well regarded in the telecommunication contracting industry in Malaysia. In 1997, we got an opportunity to participate in a tender for what is called “Outside Plant Expansion” called by Ghana Telecom of Ghana. It was an international tender and we participated in it. When the 1st round tender results were announced, we found ourselves in a strong position. Like I said before we were a smallish company. While we were very confident of our technical capability, funding was another issue. This is the story of how we got our funding strength and my written tribute to the person who gave us the helping hand. Some years ago, I was holding a relatively senior post in a PLC, which was a member of quite a large group. During that time, a friend called me up and said that a friend of his wanted to meet with me to ask for some advice. Naturally I agreed to meet him. Let’s call this friend of the friend, DZ. DZ had a construction company and he had done some civil works for one of the group companies. Various guys from this company had made all kind of change requests in the work scope during their visits, which DZ had obliged. This affected the costs, and when the time came for him to claim variations, the trouble started. DZ wanted my advice on what to do. I told him that all the group companies were independent and I did not see how I could help in any way. I also told him that if his documentation was firm, he could legally dispute the claims as provided in his contract. Whilst this would be a pain, his chances would be strong. And then we talked about general things and he left. The next time, I met DZ was at a dinner party several years later. I had, by then, left the PLC and was then working in the telecommunication company. I told him about the tender in Ghana where we had a strong chance and whether he would be interested. At the same dinner, he agreed to a JV and also to extend a shareholder loan of what was a huge amount. His finance people came over the next few days to negotiate terms etc. All were agreed smoothly and amicably. He left the full management to us, only attending and being briefed at the regular Board meetings we held. This shareholder loan gave suppliers confidence and we then obtained supplier credit for the most expensive item in Outside Plant expansion work, i.e. cables. The rest is history, rich history in my life. The project was completed successfully. The loans were all paid. We made reasonable money. For DZ, his shareholding also paid rich monetary dividends. All credit evaluation rules were broken in DZ extending us the credit. It was just his gut feel. I had only met him once before in my life. To have turned down my suggestion for joint participation would not have been surprising at all. Well, you, DZ did not and for that I, from the bottom of my heart, thank you. Your helping hand that fateful day resulted in work and changed the lives of lots of people. I still receive emails from my Ghanaian friends who are now working in large companies in Ghana or even outside Ghana, based on skills they learnt whilst with us. None of which would have been possible without DZ’s helping hand! I went to school without attending preschool. In fact, I did not know there was such a thing as preschool. Hence when I entered Standard One, I could not read or write a word of English. The first year was quite miserable. My father could not afford any tuition for me, and I just made do. Slowly I started understanding words and learnt to spell. By the end of Standard Two, I could read and write English reasonably. My classmates in school, WYK, AL and OHT came from better backgrounds and their parents bought them story books. And WYK, AL and OHT were very generous in lending me their books to read. And, boy, did I read. I loved the stories and read them voraciously. I think even in these early years, I started speed reading just because I had to return the books the next day. When I grandly (over grandly in fact) announced my Most Audacious Goal for 2008, I promised to follow the advise given by the more established bloggers that I should be polite and thank bloggers who give me a link that results in a large flow of traffic. This time, Free Money Finance, made a mention of my financial blunders in his roundup for the week of 21 January 08, and there was a spike in traffic. And a warm welcome to all FMF readers, who are dropping by for the first time. Please look around and make yourself at home. I’ll appreciate your views and comments. All of us have our own reasons to contribute to charity. How much should we give, how we should give and to whom we should give are matters which are quite personal to each and everyone of us. In a world where spending less and less is become a mantra, charity is quite a misfit. What corresponding value do we see or get when we give to charity? How should we allocate scarce funds for charity? When even paying down a punishing debt requires self discipline, what kind of motivation and self discipline does giving to charity need? I think my earliest introduction to charity was watching my eldest brother make donations to roadside beggars. My original motivations were, I suppose, also from the concept of “being good.” Being good means we should help people and one way is to make donations. As I grew older, my motivations changed. It changed from the vague concept of “just being good” to specific guidance from our Holy Book. These 3 verses (I am sure there are many other verses extolling charity) are my favorites. They are my guiding lights and give me my strong motivation to give and to expect nothing in return from the recipient(s), not even a word of thanks. I am sure that all the great religions of the world, Christianity, Judaism, Buddhism, Hinduism, Sikhism, etc., have equally compelling messages on charity. For people with strong religious beliefs, the motivation for contributing to charity may probably come from religion. What about those without strong religious beliefs? Where does their motivation and discipline come from? There are many kinds of “helping hands”. There are hands that help us in a time of dire need, there are hands that just give us a break and there are hands that show us the way. 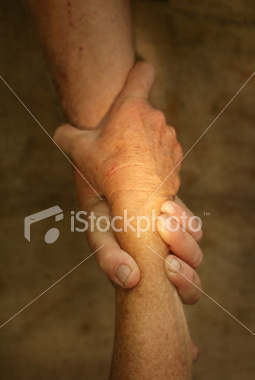 In our lives, there must have been many instances of us having been given helping hands. It could have been our teacher in school, who went out of her way and patiently taught us something that we just could not get the hang of. It could have been our boss who, based on his judgment, promoted us to a job that we had no experience in. The lucky break many talk about. It could have been some community program like this which gave a helping hand to Miguel Santos. It could have been a sibling, who sacrificed his or her wants or even needs to ensure that our needs were met. It could have been great neighbors, as Karma Calling points out. It could have been something seemingly inconsequential at that time, but the influence of which we still feel today. We may now have gone our respective separate ways and may have even forgotten about the particular helping hand. But some events may trigger off a memory, and we can’t help feeling a glow of gratitude. These days I find myself thinking a lot about the people who in one way or another helped shape my life to be what it is now. Many of whom, I did not even thank properly. This blog now gives me an opportunity to pay them tribute. Of course, I don’t expect most of them to be reading this blog, but at least my conscience will be a lot better. What about you? Have you thought about those who have given you a helping hand?